Over 1,500 Scientologists and their guests gathered for the dedication and opening of the new Church of Scientology & Celebrity Centre Las Vegas on February 6, 2010. Mr. David Miscavige, Chairman of the Board of Religious Technology Center and ecclesiastical leader of the Scientology religion, presided over the dedication of the new Church of Scientology & Celebrity Centre Las Vegas. Las Vegas staff and local Scientologists who spearheaded the drive to build the new Church joined Mr. David Miscavige in cutting the ribbon. After the ribbon was cut on the fully renovated building at 2761 Emerson Avenue, Scientologists and guests toured the new Church of Scientology & Celebrity Centre Las Vegas. The Church reception area greets visitors for introductory lectures, films, classes and self-guided tours of the Public Information Center. The Church of Scientology is non-denominational and welcomes people of every faith, seven days a week throughout the year. 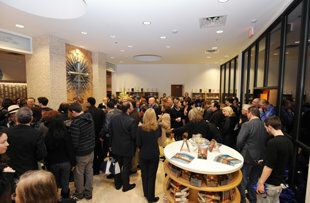 The Public Information Center in the new Church contains multimedia displays presenting the beliefs and practices of the Scientology religion. The displays are open daily to the public for self-guided tours. A special section of the expansive Public Information Center presents a multimedia exhibit of the life and legacy of Scientology Founder L. Ron Hubbard. The Las Vegas Chapel serves parishioners and guests for Sunday Services, Weddings, and other events that include important Scientology celebrations such as one noting the birthday of L. Ron Hubbard. In the Hubbard Guidance Center, spiritual counseling is provided to parishioners by ministers of the Church. Shown here is the lounge, adjacent to the counseling rooms. While the Church serves the entire Las Vegas community, it also assists artists in particular. The President's Office provides a gathering place for artists and guests coming to the Church for Scientology services or simply visiting. The new Church of Scientology & Celebrity Centre Las Vegas includes an outdoor café for the convenience of parishioners and visitors. A dazzling wall of water accents one side of the outdoor café providing an ideal atmosphere for Scientologists and their guests to meet after one of the Church’s many scheduled weekly events. 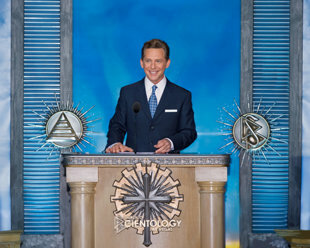 Mr. David Miscavige, Chairman of the Board of Religious Technology Center and ecclesiastical leader of the Scientology religion, presided at the evening dedication ceremony of the Church of Scientology and Celebrity Centre Las Vegas on February 6, 2010, welcoming the assembled Scientologists and guests to their new Church. He was enthusiastically acknowledged by those in attendance for dedicating the Las Vegas Church and for his instrumental role in making it possible. The new Church, located at 2761 Emerson Avenue, is set on more than three acres of the Las Vegas oasis. The former synagogue and school has undergone extensive renovation to accommodate all Scientology religious services and to serve as home for the community services the Church provides through the many activities and humanitarian programs of its members. Special guests participating in the dedication of the new Church included United States Congresswoman Shelley Berkley, Las Vegas Mayor Oscar Goodman, Las Vegas City Council member Steven Ross, and Las Vegas Neighborhood Services Department specialist and Mayor's representative to the Community Interfaith Council, Maria Castillo-Couch. “The first of this new breed was opened only just last year in Nashville—otherwise known as Music City, USA. But as your honorable Mayor pointed out, what plays in this city now plays in every other cultural capital on Earth. “So, yes—and unquestionably—when L. Ron Hubbard spoke of 'art as viewed by people, heard by people and felt by people, because art is not just the fodder of a close-knit group of initiates but the soul food of all people...' he might well have been speaking of what this city represents as a worldwide capital of art and entertainment—a place where big shows qualify as an 'act of God' and there are no words for 'over the top,' so long as people are enthralled,” Mr. Miscavige continued. “But still that's not all this new Ideal Organization represents. Because as an Ideal Church of Scientology, it's amply equipped to embrace everyone else who makes up this culture. Those in the wings of every performance, those who service, care for, prop up and cater to every entertainer—as they, too, are Las Vegas, so this Church is also theirs. And the same again for everyone else who pumps the lifeblood through this city: Its technicians, its teachers, its cops, its cooks, its managers and professionals of every description—what this Church affords is likewise theirs for the asking. Accompanied by local Scientologists who spearheaded the drive to build the new Church, Mr. Miscavige cut the ribbon and invited all to enter.